After nearly a year of patiently waiting our ultra-wide angle for Sony FE has arrived. Over the last few years I had all but given up on zooms and moved entirely to prime lenses. The Zeiss 4/16-35 FE is the first zoom in some time that has convinced me to once again add one to my bag. 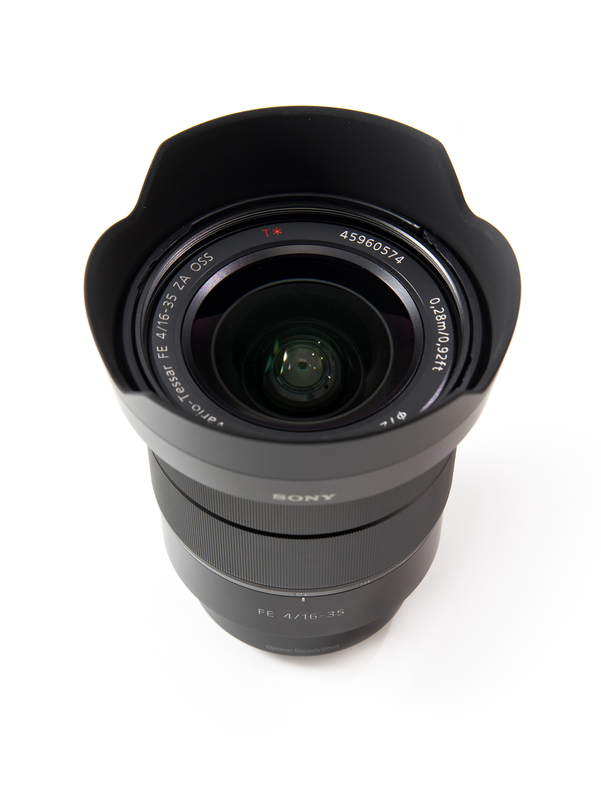 The Zeiss Vario-Tessar T* 4/16-35 ZA OSS fills an essential ultra-wide angle gap in the Sony FE lens lineup. Until now we have been forced to adapt lenses from other systems, and while that does allow extraordinary results it generally costs us in size, autofocus, and weather sealing. Sony and Zeiss have worked together to make this lens noticeably smaller than the Nikon & Canon equivalents without sacrificing image quality. After using it both in the studio and on location I'm definitely not disappointed. As an ultra-wide zoom the Zeiss 4/16-35 FE is primarily aimed at photographers shooting Landscapes, Interior/Exteriors, and other Architectural spaces although it can be very useful for wedding photographers as well. Zeiss has been wise to build in Optical Steady Shot which buys you a few stops of light gained by shooting slower shutter speeds without worrying about camera shake. Stabilization is also incredibly useful when shooting video as it gives your footage a significantly smoother and more professional look. 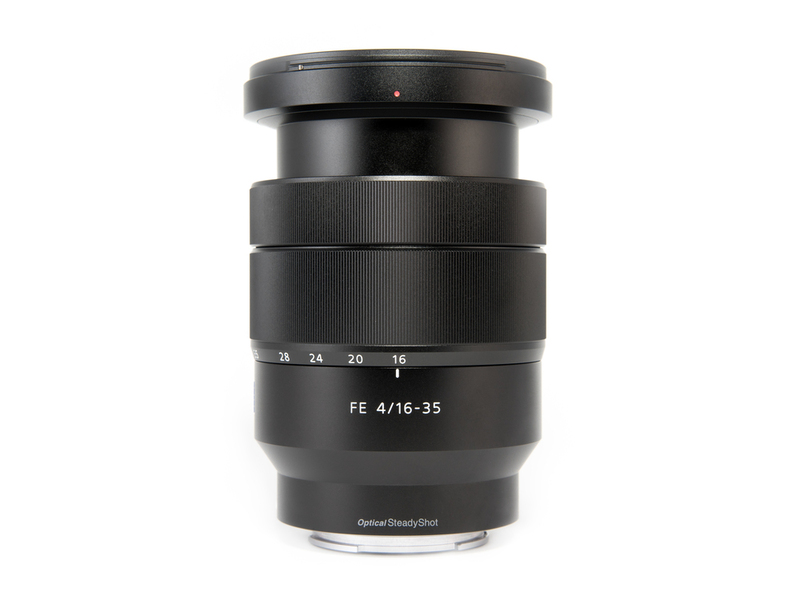 The Zeiss 4/16-35 FE has a high-performance optical design with a large diameter Advanced Aspherical element in addition to its three ED (extra-low dispersion) glass elements and legendary Zeiss T* coating. The lens gives a clean look with no knobs or switches as everything is controlled electronically from the camera body. 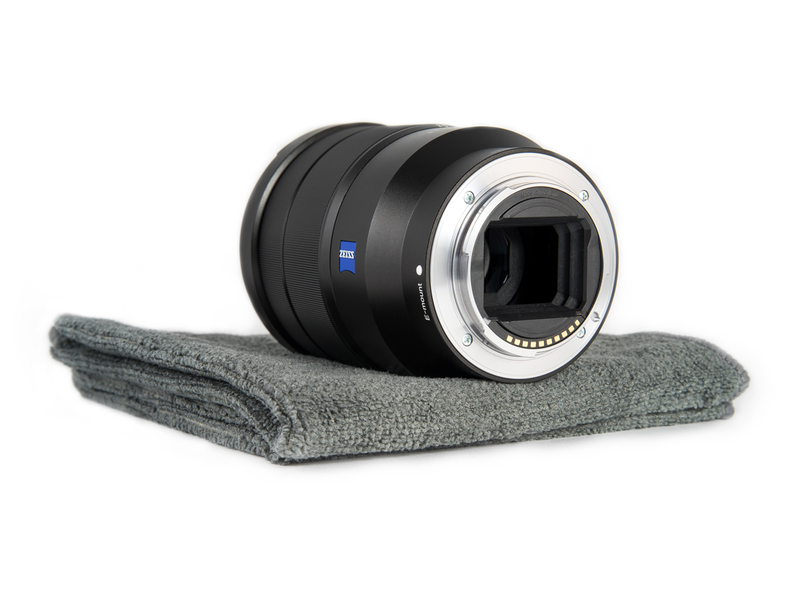 The Zeiss 4/16-35 FE takes 72mm filters and has a minimum focusing distance of 0.92ft. The Zeiss Vario-Tessar T* 4/16-35 ZA OSS features a fully premium build and feels very solid in the hand. The lens has an entirely metal construction while still remaining only 518 grams and weighing in less than the plastic Nikon & Canon versions (which are also larger, see above). If I had one word to sum up my first thoughts during the unboxing it would have to be "Precision". Everything about this lens screams quality. Zeiss engineered the zoom ring with a grooved metal texture that is superb and puts the rubber feel of most lenses to shame. This combined with their perfect choice of tension allows you to experience a greater level of precision when selecting your focal length and focusing manually. Does this affect your ability to get the shot? Not necessarily. But it certainly affects the user experience and confidence I have in the build of this lens. Let me give an example - Just about any car will get you from A to B, but a drive in a Ferrari will give you a very different experience than you'd find in my Honda. Lenses that are made by companies such as Leica and Zeiss offer a different level of precision. With that said, one qualm I do have is the the smooth metal build makes the lens feel somewhat easier to drop than some of the cheaper rubber and plastic lenses. Not sure if that is the case or if I'm just used to cheaper feel in lenses - I haven't had any issues yet but this does seem to be a lens you'll want to hang on to. This lens is also weather sealed against dust and moisture and can be used professionally in more demanding situations. Although MTF charts can be a great help when taking an initial look at lens performance they can also be quite misleading. Unfortunately, there are no standards across brands when it comes to MTF charts. With that said, Zeiss tests their lenses with significantly higher standards than most manufacturers are willing to. Zeiss tests spatial frequency to 40 line pairs / mm whereas Canon, Nikon, and Sony only go to 30 lines / mm. Since comparing MTF charts between brands can be apples to oranges, let's take a look at the real world performance of the Zeiss 4/16-35 FE. First I'll compare it to the Nikon 20mm f/2.8 AF-D which is one of the many lenses I have used to fill the native FE wide angle gap. This is a somewhat unfair comparison due to the advantages that primes have over zoom lenses, but if the Zeiss can stand it's own we know that it is a solid option despite its heftier price tag! 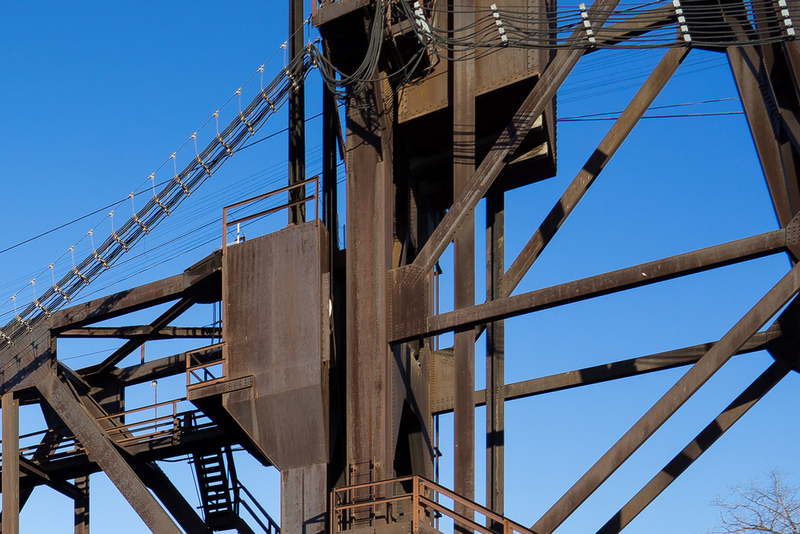 These images are completely unprocessed- RAW files moved directly into Lightroom and exported as JPG's. Click the button below to download the RAW files at each aperture and compare on your own. I've also included RAW files of the same scene at 16mm and 35mm on the Zeiss 4/16-35 FE. Although they look nearly identical in the center, the Zeiss 4/16-35 FE does ever so slightly better in the corners than the Nikon 20mm f/2.8 AF-D. It also seems to have notably less chromatic aberration in the shots that I've done. Although the Nikon 20mm has a faster aperture it shows more softness wide open and must stop down to at least f4.5 or f/5.6 to match the Zeiss wide open. Download the RAW files to see this for yourself. With that said, you would have a very hard time seeing any difference between these lenses in real world use, especially after post processing. Versatility is what you're paying quite a bit more for in the Zeiss 4/16-35. If you're not using wide angles regularly or have the ability to move your feet the Nikon 20mm f/2.8 is a better value and is still smaller/lighter even with an adapter. The Zeiss no doubt has it's place in my bag as my demands for framing are always changing and Optical Steady Shot offers other benefits along with a native mount and weather sealing. Below are some more sample images at different focal lengths along with corner crops at f/4, f/5.6 and f/11. This time I have done basic processing and sharpened them to give you an idea how capable this lens is in the corners for real work. Good news is that the Zeiss 4/16-35 FE definitely performs stronger on the wide end where we need it (whereas the corners struggle a little bit more at 35mm). This can be remedied by stopping down, although it is by no means terrible when shooting 35mm @ f/4 either. I realized once I got home that I made this comparison a bit unfair by focusing on the center of the bridge even at f4 - Some blur in the corners might just be DOF issues rather than sharpness. Here is a processed photo from a recent project with the Zeiss 4/16-35 FE. Click on it to enlarge. I found the lens very enjoyable to use in the real world. There is absolutely no lens creep and adjustments can be made with great precision. One minor quirk is that I'm not very fond of the focus by wire - I much prefer the tradition DOF scale. How do the files look? Extremely contrasty and definitely have that typical Zeiss 3D pop. I've never used a wide angle quite this contrasty and it renders colors beautifully rich. I normally add between +10 and +30 contrast to interior shots but with this I felt it became to unrealistic - no need to compensate in post to make up for poor optical renditioning of the light. Images definitely stand out! The Zeiss 4/16-35 FE handles distortion quite well compared to most ultra-wide angle lenses (Canon & Nikon equivalents of this lens included). With that said, there are signs of minor barrel distortion. Though I'll still be using PT Lens to correct lens distortion, I'm sure many wouldn't even notice with this one until you correct your converging verticals which makes lens distortion more apparent. Overall, straight lines have done a decent job of remaining straight. Lens distortion is different than perspective distortion - learn the difference here. As for native options, the Zeiss 4/16-35 FE is the only full-frame wide angle option. 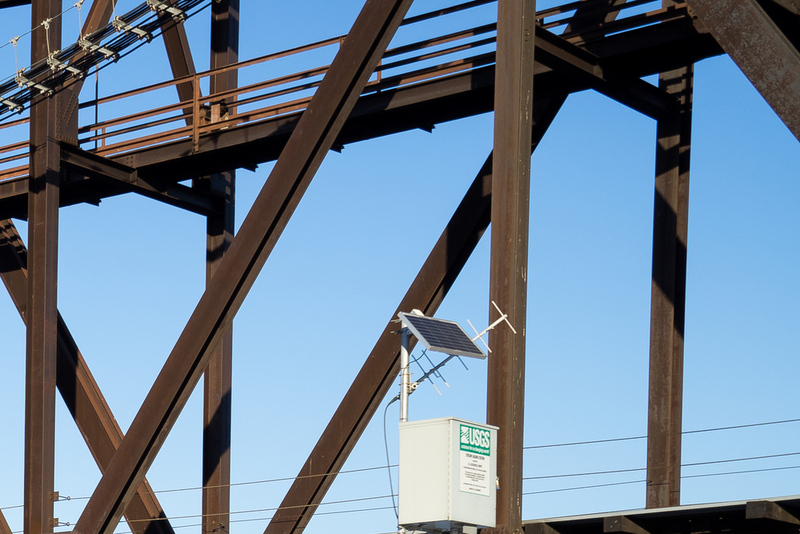 This promises us the best in Optical Image Stabilization (OSS), autofocus, weather sealing, and avoiding the additional bulk that adapters add. 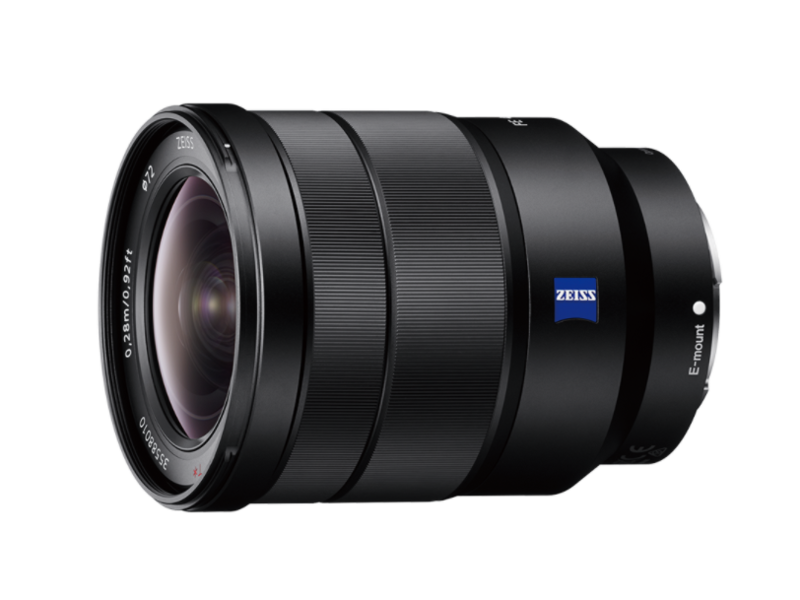 Unfortunately the Zeiss 4/16-35 FE is quite expensive at $1349 and certain alternatives might work just fine for your needs. Although the Sony SEL 10-18mm f/4 OSS has some coverage on full frame it is less than ideal and we have better options now so let's rule it out. We've already talked about the Nikon 20mm f/2.8 AF-D. Up till now I've been shooting almost exclusively on a 14mm and 20mm prime and using the resolution of the Sony A7r to make minor crops. Canon and Sony A mount also have their own versions of the 20mm which adapt quite easily. This is convienient if you shoot another system or have moved from Canon, Nikon, or Sony A mount. These are sharp primes and will compete in quality and size, but that's not the whole story. They're not as versatile in focal length and also cost you valuable OSS, AF, weather sealing, and add the cost of an additional adapter ($100-$400). The primes are ideal for the budget photographer or those who do not make a living shooting wide angles like we architectural photographers do. If size and weight are of no concern you'd be hard pressed to beat a Samyang 14mm f/2.8, Samyang 24mm f/1.4, and Samyang 35mm f/1.4. These three are optically outstanding and could all three together be had for about the same price as the Zeiss 4/16-35 f4. I still shoot the majority of my work on the Samyang 14mm f/2.8 and it is simply razor sharp. With that said, they are all mammoth sized and have no weather sealing or AF. 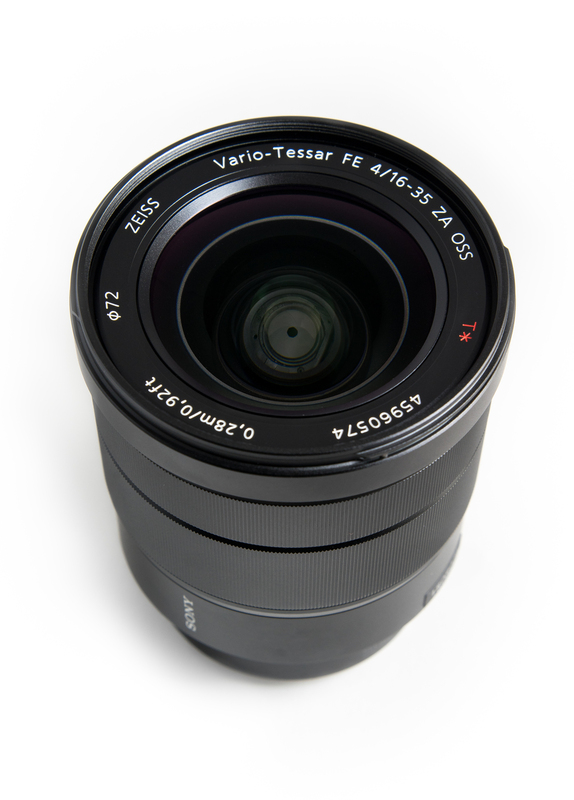 You could also consider the Samyang 24mm f/3.5 Tilt/Shift. The Canon 17-40 f4 L is also a very sharp lens and provides excellent results on the Sony A7r. It is slightly more affordable than lenses with equal quality although you'd have to splurge on a $400 metabones adapter and loose weather sealing. The Tokina AT-X 16-28 f/2.8 Pro is definitely another budget option although it would be quite large with the necessary adaptor. According to DxO Mark, the Zeiss Vario-Tessar T* 16-35 f/4 ZA OSS (paired with the Sony A7r) scored higher than either the Canon or Nikon equivalent while remaining smaller and lighter. Zoom lenses are always a game of compromise and I am very happy with the performance of this lens. The Zeiss 4/16-35 will definitely be handy for personal work as well. Optical Steady Shot is outstanding for handheld video and I will definitely be putting it to use. My new bag for day trips with the family includes my Sony A7r with the Zeiss 4/16-35 and Zeiss 1.8/55 - one extremely versatile setup. Though it is far from replacing my primes, the Zeiss 4/16-35 definitely has a secure spot in my bag. Please be sure to subscribe for future blog posts on camera gear, workflow, and post-processing!